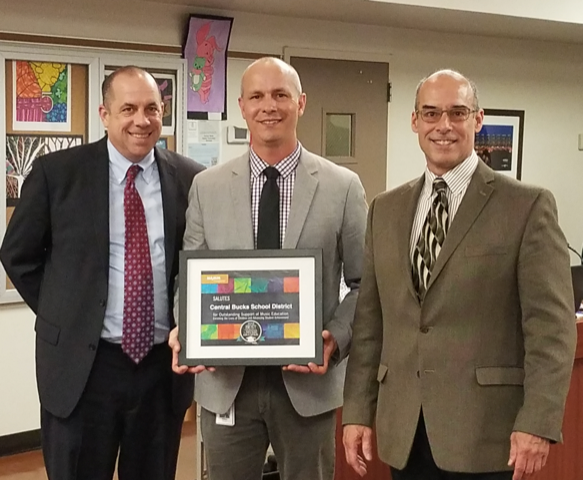 Earlier this year, Zeswitz Music presented a Best Communities for Music Education (BCME) Award to the Central Bucks School District (CBSD) in Pennsylvania. CBSD is a four-time recipient of The NAMM Foundation’s BCME designation and the third largest school district in the state of Pennsylvania. The BCME national recognition program is in its 20th year of honoring the efforts of music education champions who share in the common goal to ensure access to music for all students as part of their curriculum. The Central Bucks presentation was followed by a live performance by the Holicong Middle School Jazz Band and the recognition of several students that had been selected for the PA Music Educators All-State ensembles. When Shayler presented the award he emphasized its importance and that only four percent of school districts in the U.S. receive this national recognition. He went on to and praise the superintendent and school board for their roles in supporting the music program and for uniting the entire community. According to Bret Mascaro, the director of education at Zeswitz Music, the retailer has enjoyed the privilege of presenting BCME and the SupportMusic Merit Award Awards to several of their clients. “It’s amazing how powerful [BCME] can be for increasing awareness and community support for music education,” he said. Put the spotlight on your music program! Apply to be considered for a 2019 Best Communities for Music Education today; the deadline is Jan. 31, 2019.